Eight members of a group of nine Montagnards shelter in Phnom Penh while awaiting assistance from Cambodia's government, Oct. 3, 2015. Ethnic Montagnards who have fled Vietnam for Cambodia say they are forced to leave after enduring relentless persecution by authorities in their home country, but regularly face difficulties when they apply for asylum across the border. About 200 Montagnards have entered Cambodia illegally from Vietnam’s Central Highlands since late last year, claiming they are escaping political and religious discrimination back home, but Cambodian officials said last month that only 13 of them will be granted asylum and the rest deported. One 40-year-old Montagnard who is currently living in Cambodia told RFA’s Vietnamese Service that he was unable to support his wife and three young children because of regular harassment by authorities in Vietnam, and while it pained him to leave his family on their own, he “had no choice” but to flee. "If there was no oppression, I would prefer living in Vietnam—I didn’t want to leave my wife, children and my house behind,” he said, adding that he was in a constant state of fear at the time. But after crossing the border, the Montagnard—who spoke to RFA on condition of anonymity—said he had faced difficulty adjusting to life in Cambodia and could not obtain refugee status. “I don’t know what to do here,” he said. A Montagnard woman from central Vietnam’s Gia Lai province, whose husband was among a group of nine Christians who have been in hiding in Phnom Penh since arriving in Cambodia last month, said he had been relentlessly hassled by authorities over his religion in their home village of Ia Pet, in Dok Doa district. Since her husband left, the woman told RFA that village authorities have routinely questioned her over his whereabouts. “The local police are looking for him. They ask me where he is, what he is doing,” she said. Vietnam’s Central Highlands are home to some 30 tribes of indigenous peoples—known collectively as Montagnards, or the Degar—who suffer extreme persecution, according to rights groups. Early in the last decade, thousands in the region staged violent protests against the confiscation of their ancestral lands and religious controls, prompting a brutal crackdown by Vietnamese security forces that saw hundreds of Montagnards charged with national security crimes. Representatives of the minority group have said they are only calling for indigenous land rights and basic human rights in Vietnam, despite attempts by Hanoi to link them to overseas separatist groups. Authorities in Cambodia maintain that the scores of Montagnards who have crossed into the country from Vietnam are not political or religious refugees, but farmers who have entered the country for economic reasons. “Upon entering Cambodia, they did not report to the Cambodian authorities to apply for refugee status. Instead, they were taken to the UNHCR (United Nations refugee agency),” Khieu Sopheak said. “Their office does not cooperate with us. They just took those people in and rented houses for almost 100 of them,” he said. Khieu Sopheak added that the UNHCR must repatriate the nine Christian Montagnards to Vietnam within three months or Cambodia would deport them, despite their claims that Vietnamese authorities “arrest and torture” them whenever they practice their religion. On Thursday, the nine told RFA they were running out of food and money, and urged nongovernmental organizations and the U.N. to assist them. One of the group’s members said they would rather submit to arrest in Cambodia than face imprisonment in Vietnam. They also denied suggestions that they had received help when they set out from Vietnam on Sept. 23 and crossed into Cambodia, other than from a Cambodian farmer who helped them hail a taxi to Phnom Penh after they spent five nights walking through the jungle in Ratanakiri. Chhay Thy, provincial coordinator of human rights group Adhoc in Ratanakiri, told RFA that Montagnards entering Cambodia were initially hiding in the forests and waiting for assistance from the U.N. and local authorities, but had changed their strategy after the government began deploying troops to detain and repatriate them. “Recently, we don’t see them in the forests—instead they go directly to the U.N.’s office,” he said. 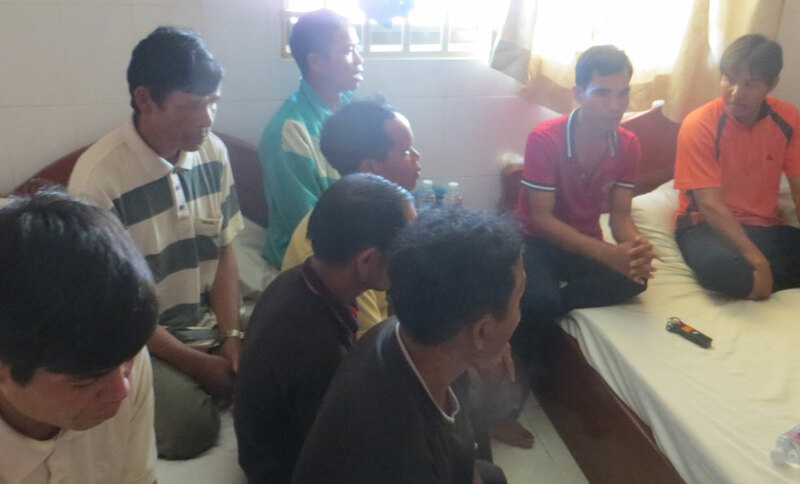 Also on Thursday, authorities in Cambodia repatriated a group of 24 Montagnards who had volunteered to return to Vietnam after being refused refugee status, according to an official with the UNHCR, which coordinated the move. The group, which included four children and had been in Cambodia since July, left Phnom Penh on Wednesday and was sent back across the border after spending a night at a hotel in Ratankiri, UNHCR spokeswoman Vivian Tan confirmed to RFA’s Khmer Service in an emailed statement. “Twenty-four people have volunteered to go back to Vietnam and we are facilitating it at their request,” she said, adding that around 200 other Montagnards remain unregistered by authorities in Cambodia. Provincial Immigration Department chief Moeun Khem confirmed that the U.N. had organized the repatriation. RFA was unable to interview any of the Montagnards due to tight security during the repatriation. Tan Sovichea, general director of the Ministry of Interior’s Refugee Department, refused to comment on why the group was refused refugee status, referring questions back to the spokesman’s office. Reported by Son Trung for RFA’s Vietnamese Service, and Ratha Visal and Tha Kithya for RFA’s Khmer Service. Translated by Viet Ha and Samean Yun. Written in English by Joshua Lipes. These Montagnards will continue to run and put their lives at risk as long as RFA and other "rights" groups promote their "oppression", "persecution", "religious discrimination"... by Vietnamese authorities with proofs. In fact, this article appears to cook up "proofs" by repeating "Christian", "the police want to talk to", "land rights"...as though they were signs of violation. Leave them alone and they will adjust to changes in Vietnam as other 5 millions Vietnamese ethnic minorities do or let them return to the jungles if they like. Adjust? really? If you were in their position, I think you would've do the same thing. My family left Vietnam 20 years ago, when I was a young boy. I can tell you that the communist scum treated the Montagnarrds terrible. Luckily US granted asylum for my family. Remember the central of Vietnam once belong to the Montagnards. My grandparents have never seen any Vietnamese before. We are not like those other 5 million ethnic, we like to keep out tradition, we like to keep our native languages and we DON'T LIKE COMMUNIST. You think about it? why do you think Vietnam afraid of Montagnards fleeing? Why are they so paranoid about Montagnards practicing Christianity? They want the world to think that Vietnam is great a country and that they does not have any human right violations. I went back for a visit in 2003, they called me and my mom to the police station for an interview. They are asked me about FULRO leaders. How am i supposed to know, i left Vietnam when i was young. VIETNAM is similar to NORTH KOREA. Yes, Montagnard Degar peoples are separatists , they have been separated for thousands of years, they have their own lands, identity, language, cultural, ways of life.....The problem is you do not recognize them as a true HUMAN , you take their lands, destroy their their culture , language....your cruel act never ends on them....your inhumanity to them never surrenders .You are the most devilish and malicious pieces on earth.